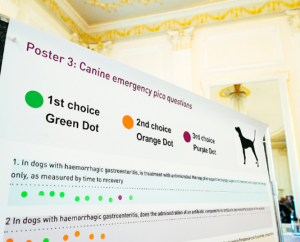 Last year we asked for your views on which clinical questions you would like to see answered within the Veterinary Evidence journal as part of the prioritisation project. Thank you for your great response – we had a broad list of PICO questions covering 4 Knowledge Group categories. These questions were then rated in order of priority by attendees at our Veterinary Evidence Today 2016 conference, which took place in Edinburgh. The PICO questions have now been ranked and the list has been published here. The next step is for these topics to be written up as Knowledge Summaries and submitted to Veterinary Evidence. If you’re interested in writing a Knowledge Summary, please email Bridget Sheppard, stating which PICO question you would like to work on, and whether you’d like to be a lead author or a collaborator, and I’ll be in touch with more information and guidance. You will be guided throughout the entire process, and our Library team will be on hand to help with any queries and to help search the literature. Writing a Knowledge Summary can contribute towards the annual CPD requirements of all RCVS members. You can find out more about recording your CPD here and here. Not only is it a great way of contributing to CPD, but you will also have the option to collaborate with others – expanding your professional network. If you have any queries or would like to get involved in any of our other projects please get in touch!